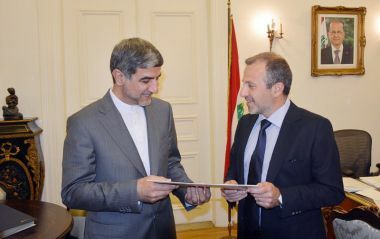 Lebanon - Caretaker Foreign Affairs Minister, Gebran Bassil, received a copy of the credentials of the newly appointed Iranian ambassador, Mohammad Jalal Feroznia, in preparation for their submission later to President Michel Aoun. The Qatari ambassador to Lebanon, Ali bin Hamad al-Marri, paid Bassil this Monday a farewell visit to mark the end of his diplomatic missions in Lebanon. Lebanon - Caretaker Minister of the Displaced, MP Talal Arslan, said Monday that the country can not endure dealing lightly with the government formation issue. Minister Arslan's words came in the wake of his meeting with Caretaker Foreign Affairs and Emigrants Minister, Gebran Bassil, at Villa Boustros. Arslan said monopolizing a sect or a community by one person or one political line disrupts the government's decision-making. He accused "the one who insists on the issue of the monopoly of the sect representation" of blocking the government formation.